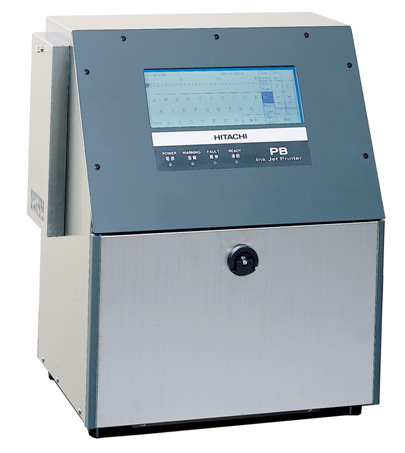 HITACHI INTRODUCES NEW LOW COST PB SERIES SMALL CHARACTER INKJET PRINTER : News Releases : Hitachi America, Ltd.
TARRYTOWN, NY, December 1, 2004-- Hitachi America, Ltd., Power and Industrial Division, today introduced its newest small character continuous ink jet printer. The PB Series has been designed to provide a simple, low cost, 2-line printer for entry-level applications. Hitachi has been manufacturing small character continuous ink jet printers since 1975. The PB Series features an 8.9” monochrome LCD Touch Panel with full intuitive menus on the screen providing easy and quick operation and maintenance. The PB Series’ unique and innovative ink circulation system helps reduce fluid evaporation and achieves a very low cost of operation. Nozzle and gutter are automatically cleaned before shut down, so no special procedures are required. The PB Series viscosity and density control feature provides stable ink drop formation and keeps print quality high. For further information contact Hitachi at inkjetprinters@hal.hitachi.com. Or visit us online at www.hitachi.us/ijp. To learn more, please visit Hitachi at PROMAT 2005, January 10-13, 2004, McCormick Place, Chicago, IL. Hitachi, Ltd., (NYSE: HIT), headquartered in Tokyo, Japan, is a leading global electronics company with approximately 326,000 employees worldwide. Fiscal 2003 (ended March 31, 2004) consolidated sales totaled 8,632.4 billion yen ($81.4 billion). The company offers a wide range of systems, products and services in market sectors including information systems, electronic devices, power and industrial systems, consumer products, materials and financial services. For more information on Hitachi, please visit the company’s Website at http://www.hitachi.com .